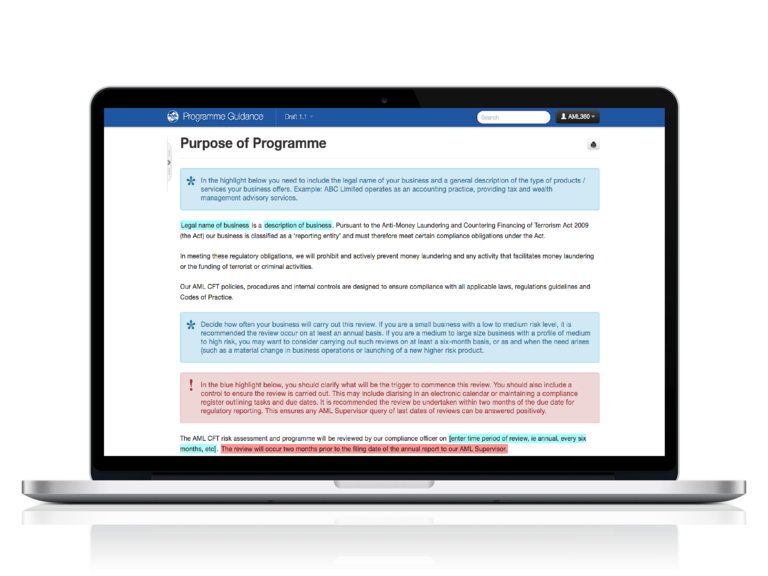 AML360 provides an end-to-end editing tool so that you can develop your anti-money laundering programme to your requirements. 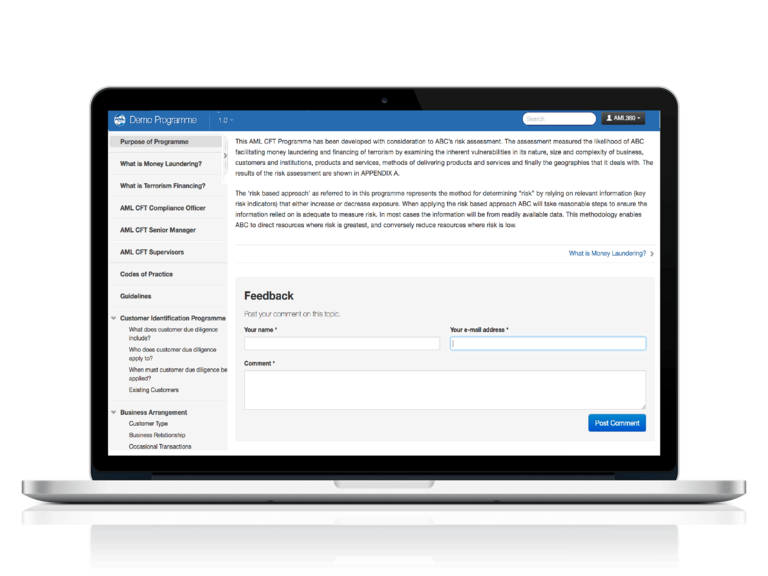 Features include the ability to collaborate with key stakeholders during policy development, embed forms for your work process flow, add your logo and branding style, embed online access to your in-house computer systems. Flow charts for customer onboarding included. Leverage agile frameworks to provide a robust synopsis for high level overviews and iterative approaches. 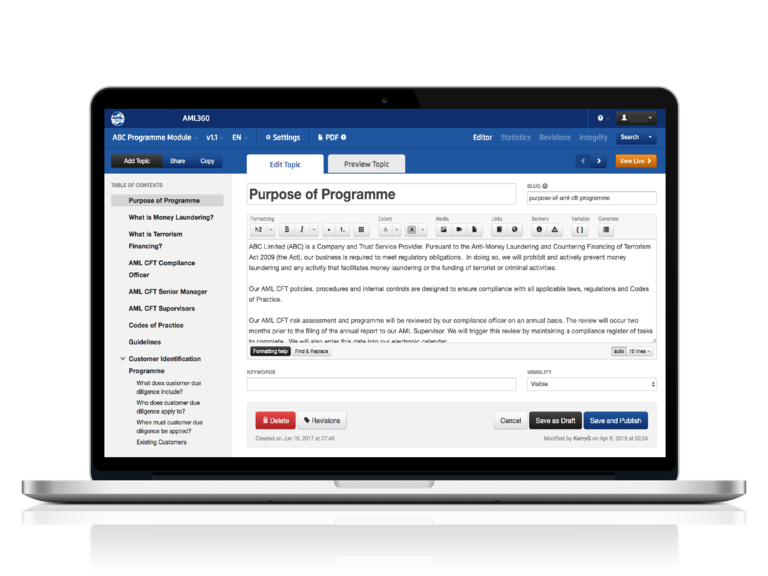 Insert your logo and use the encryption feature to embed your online Programme to your in-house systems. You can support your programme with an 80+ point compliance check list. This ensures ongoing maintenance. All updates are published instantly to your in-house link. Revisions can be tracked. Your guidance manual includes advice on best practice and mandatory legal requirements. 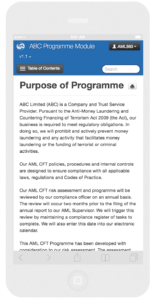 From within the programme, staff can raise questions direct with the AML Compliance Officer without the need to send an email. 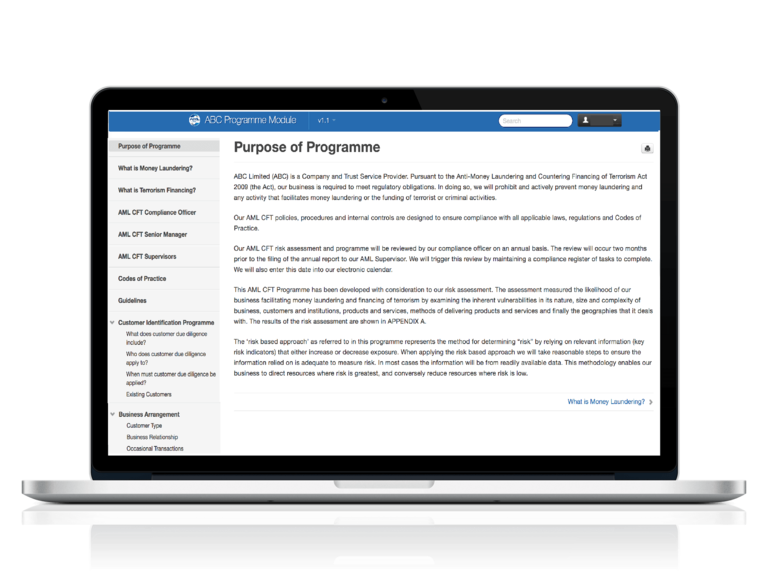 If your staff are regularly out of the office they can access the programme direct to their mobile device. You receive a comprehensive AML CFT compliance module with access to a flexible editing tool from where you can modify to your requirements. The guidance manual provides advice on best practice and highlights mandatory legislative requirements. 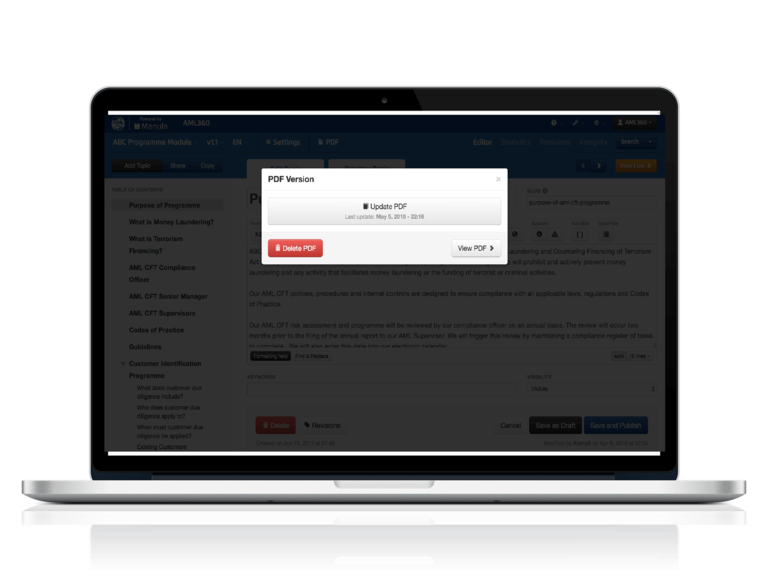 An encryption option allows your business to place your online programme onto your local in-house computer systems. 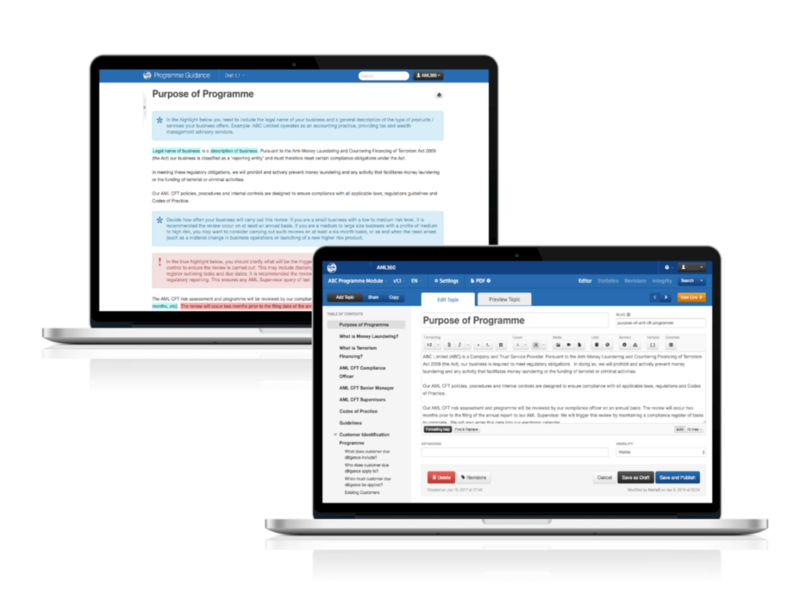 This option ensures your staff always have instant access to the most recent version. 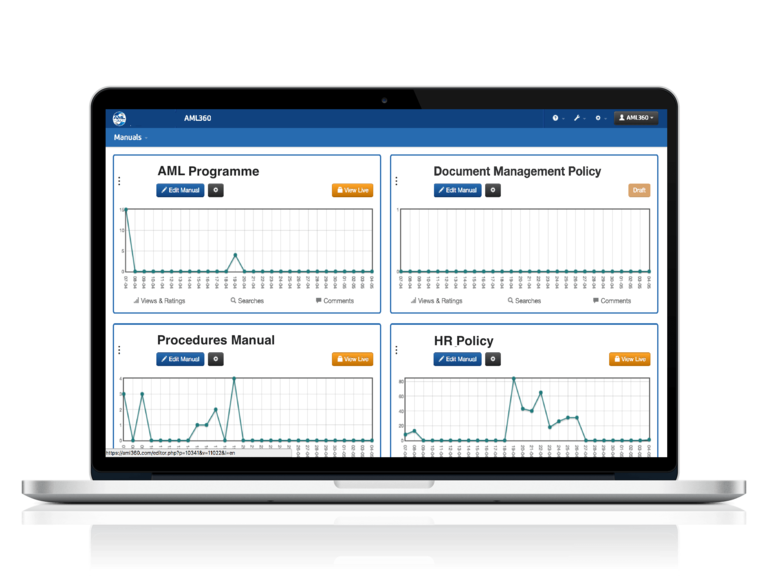 You can use the AML360 dashboard as a centralised platform for all your policies and manuals. Graphs let you know those policies that are most active. You can turn on the feedback option to respond to staff queries or for collaborating with senior management during the programme development. Feedback email notifications are sent to your AML Compliance Officer and also filed in the admin area of your dashboard. 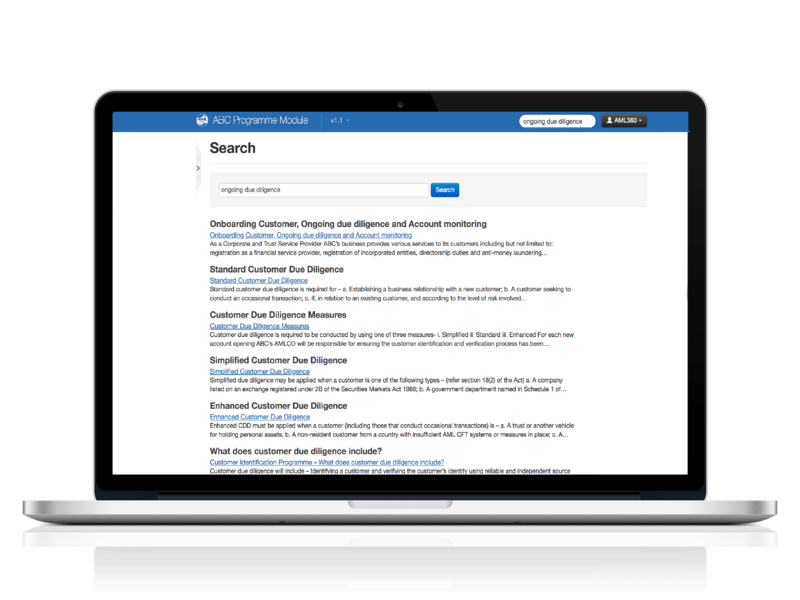 The built-in search feature produces a list of topics that best match the search words entered. The order of topics in the results is based on the appearance of the search words in the topic’s Title, Body and Keywords. You can print to PDF. A title page with the date and the version reference are automated.